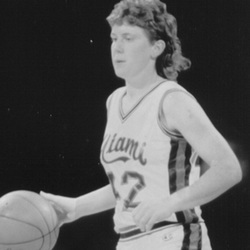 Jeannie Hebert was one of the best basketball players ever to play at Miami by the time her four-year career in Coral Gables ended in 1992. During Jeannie's collegiate career, that spanned from 1988-92, the Alaska native and guard etched her name each season further into the Miami record book culminating in the program's most successful "dream season" in 1991-92. An impact player, Jeannie started in all 119 games she appeared in, the second-most all-time career total starts by a Hurricane. For her career, Jeannie ranks second in assists (694), third all-time in scoring (1,766 points), third in free throws made (437), third in free throws attempted (583), and fourth in steals (237). Jeannie played at Miami during a crucial time in the program's development under new head coach Ferne Labati. Their first season together in 1988-89 saw the Hurricanes go 21-8 and qualify for the lady Canes' first-ever NCAA Tournament. Miami went 25-6 during Jeannie's sophomore season in 1989-90 and earned a bid to play in the postseason NIT Tournament. UM went 20-10 in 1990-91 and claimed the New South Women's Athletic Conference title. Jeannie was named the NSWAC Tournament MVP after earning second-team honors during the season. Jeannie's final campaign in 1991-92 was like no other at Miami. First, the Hurricanes made the jump to the BIG EAST Conference. That season, with Jeannie�s help the Hurricanes would go on to win the league regular season title with a perfect 18-0 conference record and swept through the BIG EAST Tournament en route to the postseason title. Jeannie went on to earn All-BIG EAST Second Team honors and was named to the All-Tournament team.